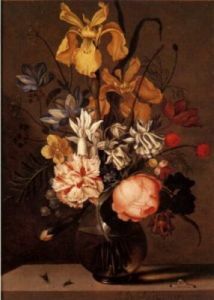 Ambrosius IV BOSSCHAERT is also a famous painter of flower piece. He was baptized in Arnemuiden on 1 March 1609, and died in Utrecht on 19 May 1645, as the son of Ambrosius and Maria VAN DER AST. In the art literature Ambrosius IV is named as ‘de Jonge’ (The Young). The first paintings of Ambrosius IV have the monogram of his father Ambrosius III: the capital letter A, within a capital letter B. Ambrosius almost continues the works of his father. In certain respects his oevre is more modern than that of his younger brothers. His work, too , reveals Renaissance-traits in the display of objects and in it scientific, naturalistic character. But the linear rhytm, sevee with Johannes and stiff with Abraham, tends toward the baroque with him. After 1634 Ambrosius the Younger’s work shows undulating outlines already observed in certain details of his uncle Balthasar van der Ast: the sinouos lizards and the dragonflies. After 1634 his austere monogram is replaced by a written signature, A. Bosschaert, which is more flowing than his brother Abraham’ signature. His works from before 1634 are still compact and static, and is more detailed than his later works. In his second period we see the introduction of a more flexuous line. The painter shows a preference for tulips with sinuous leaves, fritillaries that have gracefully bending leaves,irises with fluttering corolla. Among the enliving accessoires we find beetles, a toad, a lizard, fallen flowers abd petals, fruits, drops of water, butterflies, caterpillars, shells, snail, grasshopper, a dragon-fly, a wasp and in particular: flies. A remarkable an unique exception in his oevre is his little painting on copper (12.5x17.5cm), representing a dead frog lying stretched out on it sback, surrounded by blue-black blowflies. For the modern spectator this oppresive, macabre little painting is a more horrible memento mori than the standard 17th century Vanitas still life with skull. ‘Het vreemde en beklemmende is de aanwezigheid van vier grote bromvliegen, zwart met een zweem van staalblauw.’; and further on: ‘Men ziet eerst het dode dier en dan zijn vernietigers’. ‘In een klein doek van enkele vierkante decimeters heeft het genie hier opperste liefde en de diepste afkeer samengebracht.’ (The strange and jamming is the presence of four large blowflies, black with a trace of steelblue.’; further on: ‘One sees first the dead animal and then its destroyers’. 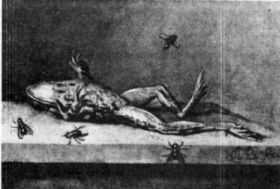 ‘On a small cloth of some square centimeters the genius has brought together the uppermost love and the deepest dislike.’) Most probably Ambrosius has just wanted to paint or illustrate a dead frog without the need of any form of symbolism. Ambrosius was married in Utrecht (Geertekerk) on 23 February 1634 with Maria STRUYS. She died in Utrecht on 23 July 1698. Dead Frog, copper 12,5x17,5 cm, sign. A.B. 1635 - Flowers 38x28,5cm. So this contract is signed by three flower painters and of the widow of a flower painter.